Each year, 3.5 million experience homelessness in America, less than a quarter will be homeless for a short time, the other 76% are chronically homeless. Pets of the Homeless estimates that as many as 10-25% have service or companion pets who need pet food and veterinary care. So many pets need our help. These pets are loyal, nonjudgmental and give unconditional love. Pets of the Homeless provides pet food and emergency veterinary care to pets that belong to the homeless. Each year, 3.5 million experience homelessness in America, less than a quarter will be homeless for a short time. However, over 76% are chronically homeless due to physical disability, developmental disability, HIV/AIDS, mental illness and substance abuse problems. 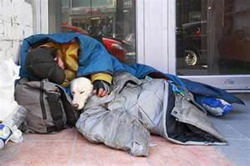 Pets of the Homeless (POTH) estimates that as many as 10-25% have service or companion pets. The need for pet food and veterinary care is at an all-time high. Pets of the Homeless (POTH), is a nonprofit organization that provides pet food and veterinary care to the homeless in local communities across the United States and Canada, is asking for assistance from business owners and managers. With the increase of the need for food for pets of the homeless, there is a need for more POTH collection sites. These sites provide the public with a convenient location to drop off pet food and supplies. The donations are then delivered to distributing organizations (food banks, homeless shelters and/or soups kitchens) that have agreed to distribute the pet food to the homeless and poor. Businesses can become a collection site at no cost by signing up on the POTH website, petsofthehomeless.org. Participating business will receive a collection site kit that instructs businesses how to collect and distribute the donations, and gives them authorization to use the POTH logo and photo resources. In addition, partners receive a guide to accessing free publicity in their area. By becoming a collection site, businesses benefit by unifying staff members, gaining internet exposure and publicizing their business to current and potential customers. These businesses also make the statement that they are socially responsible members of their community. But, perhaps the largest benefit of all is the positive impact that is made in the lives of our less fortunate neighbors and their loving pet companions. Since 2008, POTH has recruited over 470 collection sites and over 400 distributing organizations. Collection sites reporting more than 511,500 pounds of donated pet food and supplies over that time. These statistics change daily. In addition to establishing collection sites, POTH sponsors veterinarians that go to where the homeless congregate and provide wellness veterinary care such as vaccines, spay/neuter and other needed treatments. POTH also assists homeless pet owners with emergency veterinary care. With cash donations they have provided veterinary care to over 10,400 pets that belong to the homeless. Interested businesses are urged to visit petsofthehomeless.org to join and for more information.